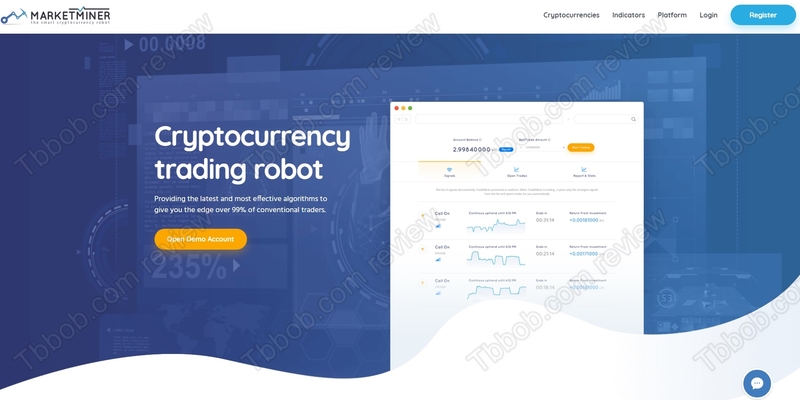 In this review we explain that the Market Miner robot and Trade Coins broker are shady and that you should avoid them. MarketMiner is a trading robot for cryptocurrencies. It will allegedly give you the edge over 99% of conventional traders. In the platform it is literally said that it will make you win. So, can you really make money with MarketMiner? Market Miner has a demo, so we tested it. And we immediately identified a huge problem. The demo is generating profits, but the platform is not showing any prices. It means that when it opens a trade for example on the BTC/USD pair, it doesn’t say what is the opening and what is the closing price. This way you cannot check it against another broker to see if it is a real simulation of trading. It is hiding assets’ prices for an obvious reason, it will manipulate the demo trades and generate fake profits to make you believe that it is profitable. Because of this fake demo we are not afraid to call Market Miner a scam. The true purpose of Market Miner is to make you deposit money with a selected broker – TradeCoins. The platform will automatically open an account for you with this broker, it won’t even ask for your permission! It will push you to deposit with this unregulated broker, because people who run this scam are getting paid by this broker for referring new depositors. That’s how it all works, they will get paid for referring you, so they don’t care that their robot will then lose your money. You should avoid TradeCoins anyway, because it obviously is a scam broker. How do we know that? We checked their testimonials and we found that they are totally fake. Check our picture to see a proof. MarketMiner provides a fake demo, therefore it is a scam. TradeCoins shows fake testimonials, therefore it is a scam. Stay away from them! If you want to trade cryptocurrencies, start on a genuine free demo with a regulated broker. Forget about free money-making trading robots, they are all scams. TradeCoins is a total scam, they take your money and when you want to withdraw they never complete the process. Total theft﻿.